ABD’s annual Christmas party event was a great success but more than just a party last year. Some of the staff decided to get together and run an auction! The auction consisted of cakes, car washes, hair gel, doggy day care and a painting all very kindly provided by ABD staff. After bidding took place a fantastic £765 was raised which went to Wiltshire Air Ambulance. PR, Events and Marketing Manager, Keshani Douglas along with Legal Assistant, Jacky Hubbard from ABD who helped to organise the Christmas Party presented the cheque to the Wiltshire Air Ambulance Team. 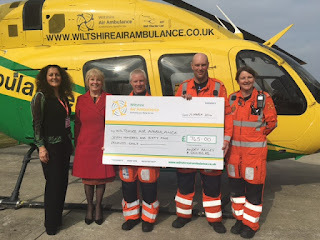 Left to right; Keshani Douglas, Jacky Hubbard with Wiltshire Air Ambulance Team. 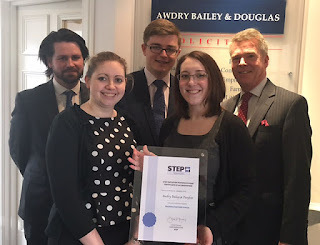 Awdry Bailey & Douglas, the Law Firm with offices based in Devizes, Chippenham, Royal Wootton Bassett and Marlborough, Wiltshire has been accredited by the STEP Employer Partnership Programme as an Employer Partner. Private client team; (from left to right) Graham Fuller (Head of Private Client), Lyndzey Cook (Fee Earner), Elliot Chambers (Trainee Solicitor), Carina Kervin (Solicitor) with Andrew Douglas (ABD Partner). The STEP Employer Partnership Programme is designed to help employers of STEP students and members to plan and deliver the best possible learning experience. 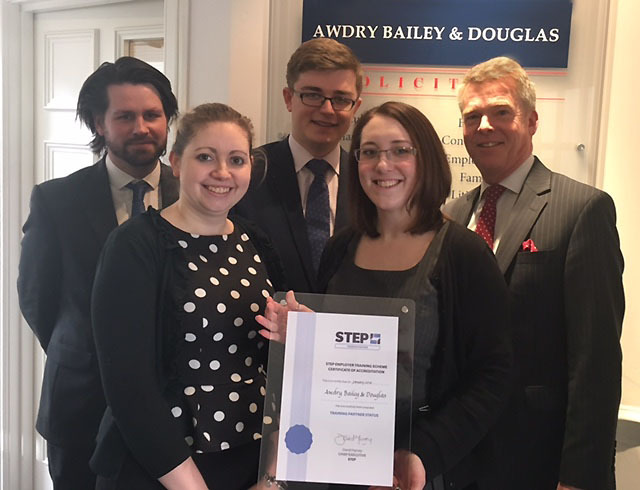 Jenni Hutchinson, Head of Employer Partnerships at STEP, added: ‘We are pleased to award Awdry Bailey and Douglas with this well-deserved accreditation in recognition of their investment in developing their STEP staff’. Today STEP has over 20,000 members across 95 countries. They include lawyers, accountants and other trust and estate specialists. Does the Care Act 2014 mean you need to know more about this country’s elderly care system and the funding options available?